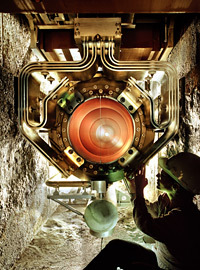 Fermi National Accelerator Laboratory, which manages the NOvA project, generates a beam of neutrinos to send to a 14,000-ton detector in Ash River, Minnesota. The particles complete the 500-mile interstate trip in less than three milliseconds. Because neutrinos rarely interact with other matter, they travel straight through the Earth without a tunnel. Scientists detect a small fraction of the neutrinos in a near-detector at Fermilab and in a larger far-detector in Minnesota looking for signals that the neutrinos are changing from one type to another on their trip. Scientists cannot catch the same neutrino in both detectors to check if it has changed, so they need to use statistics to determine what is happening. Most of the neutrinos detected in the near detector should be muon neutrinos. 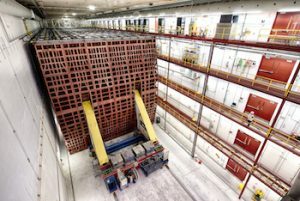 If scientists notice very few electron neutrinos passing through the near detector and a larger percentage of electron neutrinos passing through the far detector, that will let them know that some of the muon neutrinos from the NuMI beam have become electron neutrinos during the trip to Minnesota. Particle physicists use magnets to steer charged particles through their particle accelerators. But neutrinos have no charge. How can physicists steer a beam of neutrinos? Scientists create the NuMI [Neutrinos at the Main Injector] neutrino beam by firing protons from Fermilab’s Main Injector into a graphite target resembling a long roll of quarters. Many different types of fundamental particles come out of the collision between the protons and the target, including pions, which are charged particles. Physicists use magnets to steer the pions in the direction they want the neutrinos to travel. The pions eventually decay into muons and muon neutrinos, which continue on the same path the pions were traveling. The neutrino beam is aimed downward at a 3.3° angle. Although the beam starts out 150 feet below ground at Fermilab, it will pass as much as six miles below the surface as it travels toward Ash River. 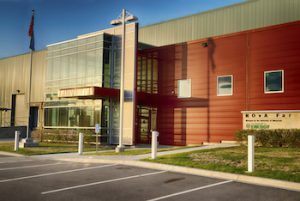 The Fermilab accelerator complex currently is capable of delivering 700 kilowatts of power to the NuMI beam, but part of the NOvA project will include an upgrade to the accelerator to allow it to provide up to 900 kilowatts of power to NuMI. The NOvA experiment uses two detectors: a 300 metric-ton near detector at Fermilab and a much larger 14 metric-kiloton far detector in Minnesota just south of the U.S.-Canada border. The detectors are made up of 344,000 cells of extruded, highly reflective plastic PVC filled with liquid scintillator. Each cell in the far detector measures 3.9 cm wide, 6.0 cm deep and 15.5 meters long. When a neutrino strikes an atom in the liquid scintillator, it releases a burst of charged particles. As these particles come to rest in the detector, their energy is collected using wavelength-shifting fibers connected to photo-detectors. Using the pattern of light seen by the photo-detectors, scientists can determine what kind of neutrino caused the interaction and what its energy was. A neutrino beam, much like a beam of light from a flashlight, gradually spreads apart as it travels. The width of the NuMI beam at Fermilab starts at about six feet and grows to several miles by the time it reaches the far detector in Minnesota. The NOvA detector is located slightly off the centerline of the neutrino beam coming from Fermilab. At this off-axis location, scientists find a large flux of neutrinos at an energy of 2 GeV, the energy at which oscillation from muon neutrinos to electron neutrinos is expected to be at a maximum.